Spring cleaning, our favourite event of the year! Spring cleaning is synonymous with doing a deep clean of your entire home, paying close attention to the spots and crevices that are usually passed over. It’s important to do a thorough cleaning regularly to maintain the condition of your home’s assets, such as floors, bannisters, window dressings and steel fixtures. There are so many reasons to embrace spring cleaning. It increases your productivity, cuts down on allergens in the home and improves your mood. Having a clean home is a great way to reset your focus, and puts you in the right starting place to conquer spring and summer. Take our professional tips for how to spring clean like no one’s business! Clutter does us all in. A good way to start your spring cleaning efforts is to go through your house (including closets) and collect anything you’re not using on a regular basis. If it’s not serving a purpose, let it go. Reducing your household clutter will make spring cleaning a lot easier. You’ll also find your home looks much cleaner just by getting rid of your redundant items. Make sure you work top to bottom when cleaning your home. That means cleaning your ceilings, your topmost fans, your window dressings and your door frames first. When you clean high up areas, invariably some dirt will fall to the ground. It’s no problem if you clean your floors last. Dip a sponge (a mop with a sponge attachment works great) into the mixture, wring the excess moisture out and apply to your ceiling and walls. Don’t scrub too hard; you don’t want to affect the paint. Nothing works on windows like a professional cleaning, but you can definitely take on the task yourself. Regular cleaning products such as Windex do wonders, but you can also fill a spray bottle with a 50/50 solution of water and white vinegar. Spray your windows thoroughly, then wipe off the solution using paper towels or newspaper. Now that you’ve worked from top to bottom, it’s time to tackle those floors. Sweeping and mopping won’t cut it for a spring cleaning. For carpets, use a high-quality vacuum cleaner. Modern vacuums will actually eliminate allergens in the air. This is perfect if you have pets in your house, or if you or your family members have any sensitivities. If you have wood floors, spring cleaning is a great opportunity to apply a coat of wax. This will help keep your wood floors gorgeous for years to come. Wood floors are a point of value in a home. Make sure you maintain them, whether or not you’re contemplating ever selling your home. Bathrooms demand regular cleaning as it is, but spend a little extra time for spring cleaning. Wash the ceiling and walls as you did in other rooms, and clean off your shower curtain. If your shower curtain is looking extra grimy, swap it out for a new one. Clean off all tiled surfaces with a neutral pH cleaner. Baking soda and water work well. If you have a lot of grout between tiles it’s best to call in professional cleaners. You could spend all day on that grout, but not get very far. It might seem a bit extra to clean your cleaning tools, but brooms are magnets for dust bunnies, stray hairs and allergens. You only have to swish your broom around in a bucket of warm, soapy water, then leave it to dry. Your bedding gets washed regularly, but what about that mattress? Your mattress could use a good vacuuming at least once a year. If you put a mat down on top of your mattress, give it a launder. Using a damp cloth (either wet with water or a polishing solution) go over all the surfaces in your home. Countertops, bookshelves, furniture legs, bed frames, banisters—anything that can collect dust, give some attention! Stainless steel fixtures are impressive when they’re gleaming! You can use a mild soap solution, white vinegar, club soda or special steel cleaning solutions to buff and polish your metal wares. Don’t use anything abrasive, anything with particles, chlorinated cleansers, sanitizers or bleach. They could cause an adverse reaction with your lovely steel fixtures. It’s the most wonderful time of the year! 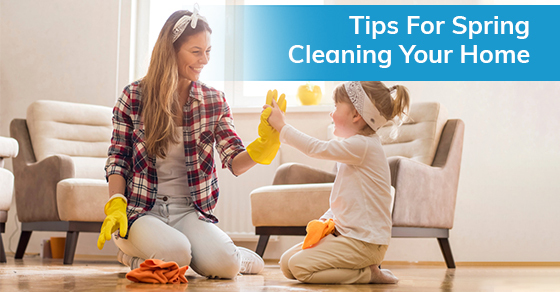 You’ll feel like you’re in a brand new home after going through the ritual of spring cleaning. Your home will look better and will withstand the test of time if you give it regular, through attention. Allergens and dust bunnies will be no more, and you’ll be able to relax in an orderly home at the end of it all. Not as enthusiastic about spring cleaning as we are? Sunrise Cleaning provides house cleaning and maid services in the North West GTA. Home cleaning in Oakville doesn’t need to be a chore. Call us at (289) 814-1824 or contact us here.